Back to the metallic embossing! This is one of my favourites! I'll show you it's blonde little sister on Friday. then heat embossed with black. 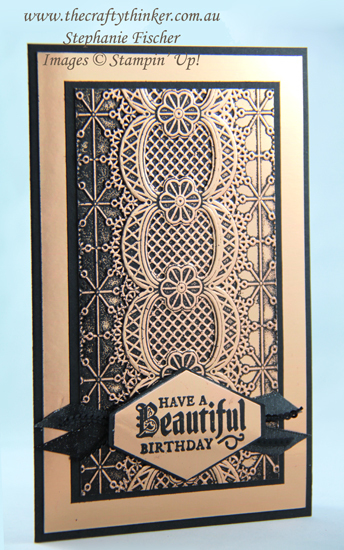 I used Copper Foil Sheet and black heat embossing for this one, using the same technique as for these cards and these ones but using the Lace embossing folder. The greeting from the Painted Glass stamp set was black heat embossed onto a small piece of Copper Foil Sheet and then stamp out with the Tailored Tag Punch. I then punch two more Tailored Tags from Basic Black Cardstock. One I cut in half horizontally and the other was cut in half vertically. I then glued all the pieces to the back to create a black edge around the copper label. I folded some Black Shimmer Ribbon and Black Mini Sequin Trim and glued them behind the label, cutting the ends at an angle and then adhered the label to the card front. The dimensions for this card are a little odd - I built them around the embossed centrepiece. Base Card: 8 3/4" x 6 3/4" folded in half to finished size 4 3/8" x 6 3/4"
Foil: 4 1/8" x 6 1/2"
Black: 3 3/8" x 5 3/4"
Embossed centre: 3 1/8" x 5 6/8"